WOW. I have been dreaming of lavender recipes lately....and finally, I tried something with my dried lavender (courtesy of the bulk spice department in Whole Foods). Chocolate & lavender are an amazing team. If you like the smell of this herb, then you will like the taste of this treat. If you don't...then maybe you should still try it--but make 1/2 a recipe. 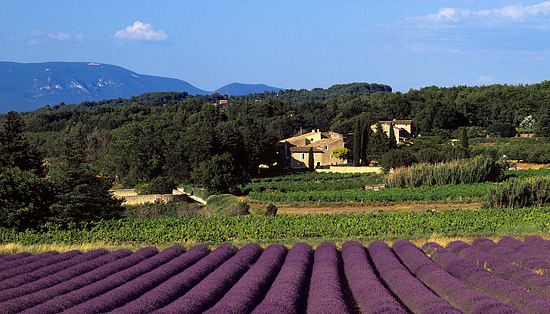 Lavender is native to the Mediterranean region. I've heard a lot of people say that they can't imagine lavender in food--that it just reminds the of soap. I suppose it is clean & relaxing. And the word does come from the latin, lavare, which means 'to wash'...It's one of those herbs like cilantro or tarragon--you either love it or hate it. I happen to love it. 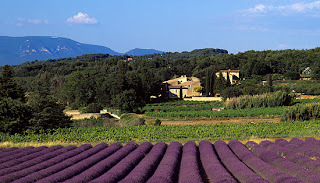 My aunt and I dream of visiting lavender fields across the globe! There is something incredibly decadent about combining these two flavors--the peaceful, calming nature of lavender--with the explosive, luxurious, and deep flavor of chocolate. It's like having a vacation in a bite! 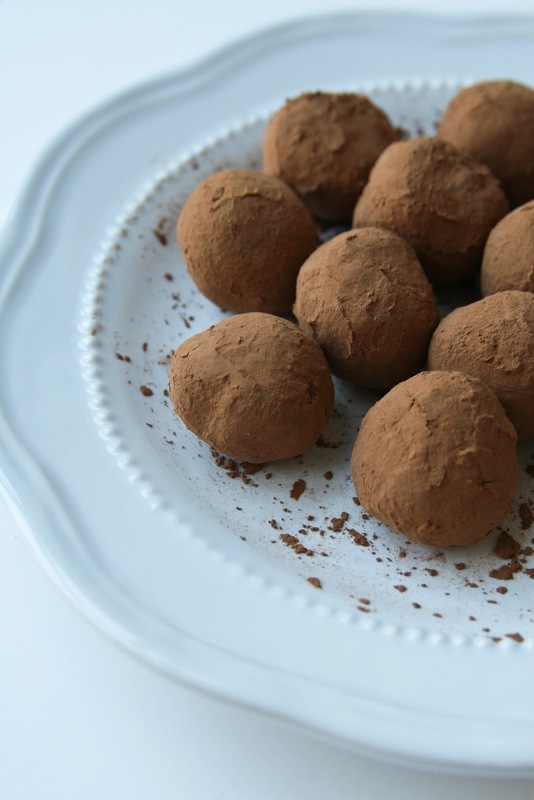 Truffles are an easy, but heavenly, treat to make. When making these heady treats--read my recipe all the way to the end first--I wrote a note on whether to include or eliminate the lavender flowers. 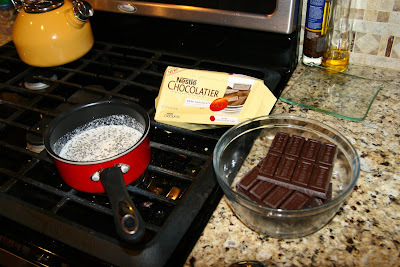 Chop chocolate into small chunks (I actually didn't even bother to chop them! ), place in medium size bowl and set aside. Simmer cream in small sauce pan. Once simmering, pour in lavender buds and vanilla, whisk together. 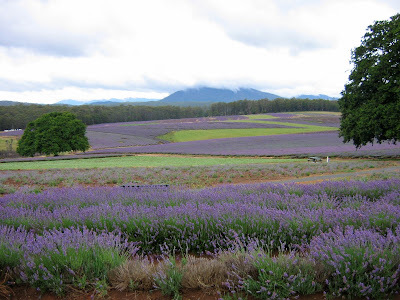 Now, this is just my suggestion-- let sit a few minutes to let the lavender flavor fully set and then strain the lavender pieces out through a sieve (RESERVING HOT CREAM!) Some people don't like their chocolate to have anything in it--like herb leaves/buds. I prefer my chocolate smooth so I can be undistracted during my afternoon moment of bliss as I tune out the cats that are in heat on my porch, the crashing of some dish off the countertop my toddler has pulled on, or the sound of the garbage truck dragging my recycling across the street. But, that's just me and my untethered moment (bliss). After the mixture is smooth, place in fridge for 3 hours or more. 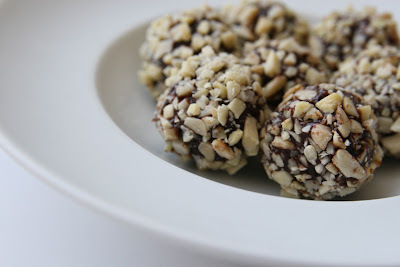 Remove bowl and with a teaspoon or melon baller, roll out balls of the chocolate, placing on a cookie sheet lined with parchment paper. Place the cookie sheets back in the fridge for another 30 minutes. When truffles are firm, roll in your (clean) hands quickly to form small spheres (the temporary heat of your hands helps the cocoa/almonds to adhere to them better). 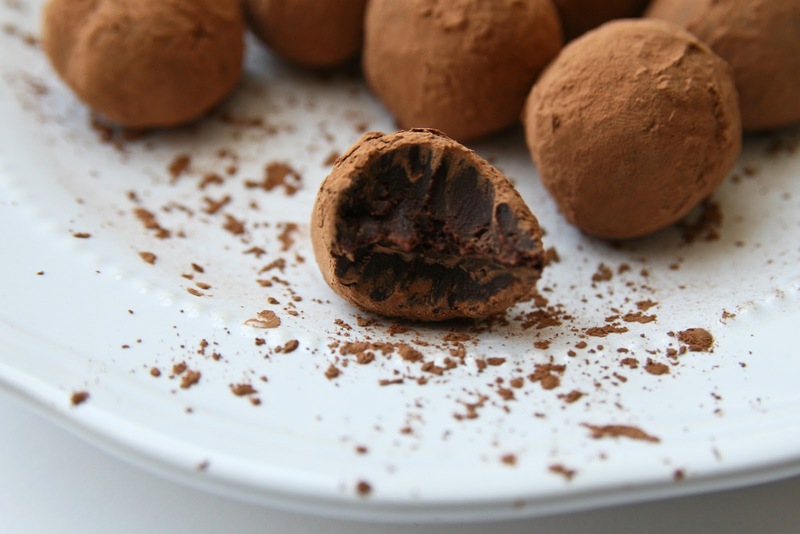 Roll these round spheres in cocoa powder or the chopped almonds, and either serve or return to the fridge for safe keeping. Store in refrigerator. They save for at least several weeks!! Yet another average gal having fun with food. From the corporate world to home. From suburban to urban to country. From amateur to food lover. Finding joy and nourishment with semi-vegetarian and semi-healthy cooking. If Lucy Ricardo lived on Wisteria Lane and shopped at Whole Foods, this would be her blog.